When Brown wasn’t blaming the fires on President Donald J. Trump, he was questioning Trump’s Christian bona fides and his character. “I don’t think President Trump has a fear of the Lord, the fear of the wrath of God, which leads one to more humility, and this is such a reckless disregard for the truth and for the existential consequences that can be unleashed,” he told CBS News’ “60 Minutes” last week. Time to sound the jerk alert because there are a couple of big ones in our midst — and their names are Jerry Brown and Al Gore. Because real climate scientists disagree with them. One such scientist is University of Washington meteorologist Cliff Mass, who argued that the data “strongly suggests there is no credible evidence” of climate/change-global warming-fueled wildfires along California’s coastal regions, adding that to suggest so is “baseless, if not outright wrong,” he stated, as quoted by the Washington Times. 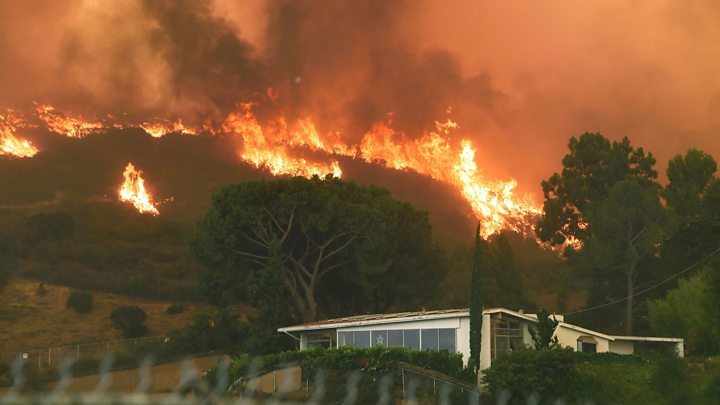 “The bottom line of all this is that observations and the best scientific reasoning do NOT suggest that global warming is enhancing CA coastal wildfires through effects on temperature and precipitation,” he wrote on his weather and climate blog. The real culprit, he said was the occurrence of heavy rains earlier this year in the state following five years of drought, which resulted in high vegetation growth now feeding the flames. Mass is by far not the only climate scientist pooh-poohing the Brown-Gore nonsense. “The destructive fires in California are not unexpected given the wet winter last year and resultant plant growth, followed by hot and dry weather since then in which the vegetation dried out,” said University of Colorado-Boulder meteorologist Roger A. Pielke Sr. in an email to the Times. “We’re about ready to have firefighting at Christmas. This is very odd and unusual,” he added. Bjorn Lomborg, president of the Copenhagen Consensus Center, compiled data from 1926-2017 showing that the acreage burned by U.S. wildfires has dropped fourfold since peaking in the 1930s, which was posted on the skeptics’ website Climate Depot. “You know, events like this are now reported daily on the news with a terrifying drumbeat of regularity, the so-called ‘new normal,’ but it’s not normal at all, and we have to speak up and act,” Gore said during his Climate Reality Project’s “24 Hours of Reality” event, which listed “more destructive and widespread wildfires” as one consequence of climate change. Wrong. Because if acreage burned by wildfires is down fourfold, then it’s safe to assume that there aren’t as many wildfires to report, right? For his part Mass further argued that using the excuse of ‘dry vegetation’ doesn’t hold up either, because vegetation this time of year in the region is always dry, no matter how much precipitation Southern California got earlier this year. And as for the “human-caused global warming/climate change is settled science” argument that these insane Leftists continually mouth, John Abatzoglou, associate professor of geography and climate at the University of Idaho, had something to say about that. “We don’t have any mature science [that I’m aware of] that would implicate climate change as being behind the delay in the autumn rains,” Abatzoglou told the Times in an email. Previous :The un-funny and unhinged Chelsea Handler gets ripped over her mocking of Sarah Huckabee Sanders: Why are Leftists such rotten people?